One of Hamilton's most prominent rugby pitches is being blamed for causing skin infections among footy players. 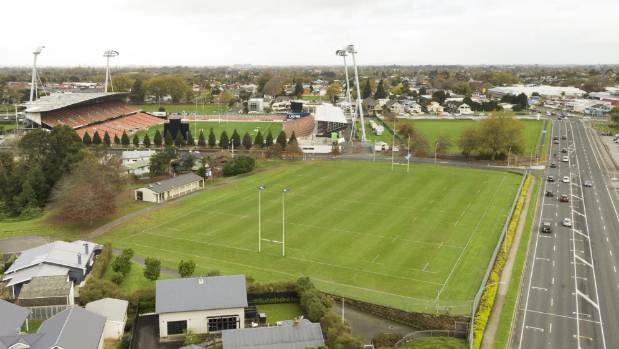 At least three club players say they developed infections this season after playing on Fraser Tech RFC's home ground - opposite FMG Stadium Waikato. The players have declined to be named for fear of repercussions but their claims have renewed fears over the safety of the Mill Street field. Hamilton City Council records show a rabbit poisoning operation once occupied the site of Fraser Tech RFC's home ground on Mill Street. In the background is FMG Stadium Waikato. In 2005, three Fraser Tech rugby players were hospitalised with mystery infections after playing on the council-owned pitch and one of them is now calling for testing to solve the issue. Hamilton City Council parks and recreation manager Maria Barrie said the council hadn't received any recent complaints about the playing field and appealed to any concerned players to contact the council. In 2015, the city council put up signs inside the Fraser Tech's changing rooms advising players to cover any wounds due to the possible presence of "natural bacteria" in the playing field. Barrie said the signs were in response to a past complaint made by a club via the Waikato Rugby Union. The signs have not be erected at any other council-owned sports fields but Barrie said the Fraser Tech ground was safe. "We've consulted with our agronomist and an environmental health officer and we were advised that it's likely bacteria in the soil," Barrie said. "But we were also advised that it's not uncommon for rugby players to experience some issues with cuts and we thought we'd take the precautionary measure of reminding them to wash after games." City council records show a former rabbit poisoning factory operating on the site of the sports field from 1909 to the mid-1950s. The factory was decommissioned in 1961. The council has been advised that none of the chemicals stored at the site could cause skin infections. The rugby ground was opened by the city council in 2005 following the extension of Mill St through to Hall Street. That same year, three players - Greg Wells, Sean Hohneck and Anthony Hedgman - were hospitalised with mystery infections after playing on the field. The incident caused the pitch to be temporarily closed. Hohneck, a former Chiefs player and New Zealand Māori representative, said medical staff later ruled out the rugby field as the source of his infection but he didn't know the cause of his teammates' illness. Wells reportedly came close to losing his leg after a sprig wound on his thigh became infected. He had to undergo five operations in 11 days to remove infected tissue. Hohneck said the only way to give players certainty was for the council to thoroughly test the pitch. "If the council own the field then they should do a soil sample and test it and then there would be no discussion around it." Barrie said the council had no plans to test the site, saying they wouldn't know what to test for without further information. Fraser Tech Rugby Club president John Moore said the club hadn't received any complaints about the field. He had only recently noticed the council's signs inside the club's changing sheds but said it made sense to remind players to clean their wounds after a game. In his three years as president, Moore said he hadn't heard of any concerns with the ground. Waikato DHB medical officer of health Richard Wall said it was unlikely bacteria in the soil was causing players' wounds to become infected. The health board hadn't been made aware of any concerns with the field but Wall said a likely explanation was players' wounds were becoming infected through player-to-player contact. Wall said the advice from the Hamilton City Council for players to cover and clean any wounds was appropriate. In a statement, Waikato Regional Council land and soil scientist Michelle Begbie said the council hadn't received any complaints about the Mill St field. Begbie said regional council records noted a small area close to the rugby ground did appear on its Hazardous Activities and Industries List (HAIL) register. "However, we have very little information about this site on our register, so we are not confident of its exact location with regards to the rugby field," Begbie said. A letter on file from the regional to city council suggested soil sampling may have been done by Hamilton City Council around 2000 and more information had been requested on this. "Until we have any more information we cannot make any assertions about the quality of the soil in this area," Begbie said. Wall said any residue pesticides in the soil wouldn't cause players' cuts to become infected. "That's a completely unrelated issue and has nothing to do with this. Pesticides don't cause skin or wound infections. You need to have bacteria or micro organism and pesticides kill micro organisms." Hamilton Old Boys' Rugby and Sports Club president Rena Schuster said it wasn't unusual for players to pick up infections throughout the season. "There have always been legends around old landfill sites and that sort of thing, but I don't know of any of our guys that have been affected," he said.